William Perry says he prefers to be called Bud, but now you can call him rich. 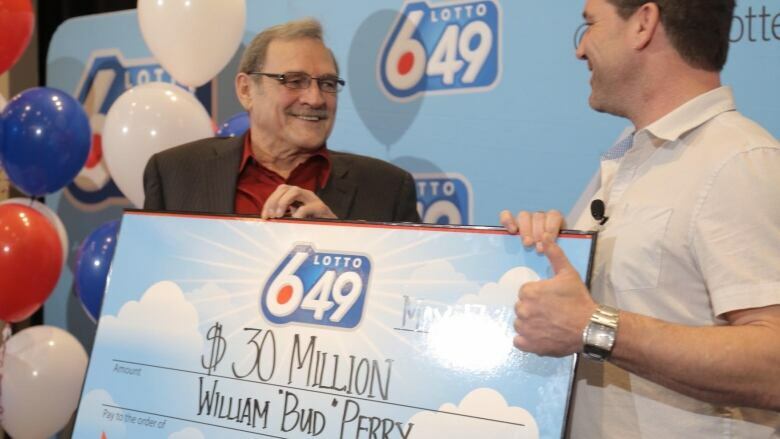 The 77-year-old couldn't believe what he saw on his Lotto 6/49 ticket from the May 10 draw, all the numbers matched: he won the $30 million dollar prize. William Perry says he prefers to be called Bud, but now you can call him rich. The 77-year-old couldn't believe what he saw on his Lotto 6/49 ticket from the May 10 draw, all the numbers matched: he won the $30 million prize. Perry and his friend took the ticket to a store to confirm at an OLG machine. "The retailer could hardly catch her breath" said Perry. "She was so happy for me." Perry described the last few days as hectic few while coming to grips with how drastically his life is about to change. "Not prepared for it, I can't eat or sleep properly." Perry is a retired crane operator who loves to play golf. He says he expects to play even more golf now. "I play golf with a great bunch of friends and would love to take my game to the best courses in every single province and territory," said Perry. "It might not improve my swing but it'll be a lot of fun." He also describes himself as an inventor, and plans to use the money to help bring some of his creations to fruition. "I have several prototypes all connected to the construction industry that I am excited to further develop and then market." But Perry said that will all be secondary, taking care of his family comes first. "Family means everything to me. My wife was my best friend and my children and grandchildren are my life. I am not the mushy type, but my family knows that they are my number one priority." His family stayed by his side when he nearly lost everything in 1983. He used his own money to finance one of his inventions, but it didn't work out. Perry got a little choked up as he reflected on that difficult time in his life. "It was terrible, I had spent almost three months on welfare," he said. "There will be a cheque going to them, a gift to Canada to pay it back."